Strawberry paper ornaments add a fresh burst of color, whether you’re decorating a kids’ play area or hosting a strawberry-themed fiesta. Their basic shape and colors make them simple for kids to draw and enhance with their own creative touches, such as a smiley face. In a few basic steps, you can help kids turn their strawberry drawings into ornaments that will keep these bright berries on display all season. Draw a large strawberry on red construction paper with a pencil. Large, simple shapes will be easiest to cut out. 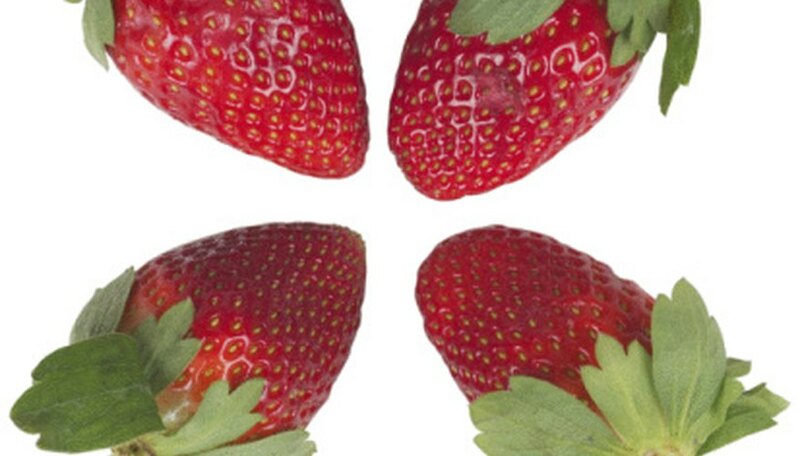 Make the top of the strawberry at least twice the width of the rounded top. Draw three oval leaves on green construction paper. Make the size of the leaves proportional to the strawberry. They should cover the top of the berry with the ends hanging slightly over the side of the berry. Use a white or black crayon or marker to make dots over the body of the berry. Place the dots randomly and space them evenly apart. Cut out the strawberry and green leaves with paper scissors. Glue the ends of the leaves to the top of the strawberry. Place the strawberry on thin cardboard or card stock once the glue dries. An empty cereal box can be cut open and one of the sides used. Trace the strawberry and leaves with a pencil. Cut out the strawberry shape from the cardboard. Glue the cardboard to the paper strawberry, aligning the edges carefully so neither paper or cardboard hang over. Poke a hole through the top of the strawberry with a hole punch or the end of scissors. Pull a length of string, ribbon or yard through the hole and knot it at the top. Hang the strawberry on a hook. Color in the cardboard back to make the strawberry two-sided.